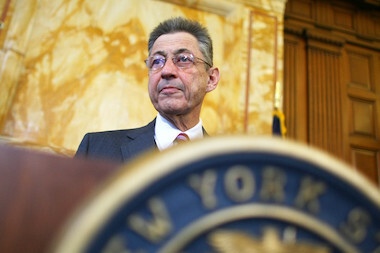 Sheldon Silver was convicted in November 2015 on corruption charges. LOWER MANHATTAN —The choice for a Democratic nominee for Sheldon Silver’s former State Assembly seat is being called “undemocratic” by some critics. A small group of Democratic Party leaders chose Alice Cancel Sunday as the Democratic candidate who will vie for Silver’s seat in a special election on April 19 — but some are calling her candidacy a win for the same old-school power brokers that supported the disgraced Silver. The longtime political clubs that supported Silver still have power, and backed Cancel, critics said. Sources told DNAinfo that both Silver’s former chief of staff Judy Rapfogel and his wife Rosa Silver voted for Cancel. Cancel, a longtime Democratic district leader from the Lower East Side, was elected as the party’s candidate Sunday, after a vote by the Democratic County Committee for the 65th Assembly District. Less than 200 people vote on behalf of Democrats in the assembly district — a district Silver represented for nearly 40 years before he was convicted on corruption charges last November. Several of the candidates vying for the seat have called the process of choosing a Democratic candidate unfair. "This process is not one anyone would have chosen-to reflect the diversity of our district, and to be fully democratic,” Niou said in a statement. "I am withdrawing from this flawed process-and look forward to sharing my vision for Downtown in April and in September with all those who have no voice here, but who need and deserve so much from their Assemblymember." Niou, who lives in the Financial District, will still run in the April 19 election, open to all voters in the 65th Assembly District, but as a candidate for the Working Family Party. Cancel, who works for Comptroller Scott Stringer — though Stringer gave his endorsement to Niou for the seat — had the backing of several “machine organizations” said Paul Newell, a candidate who came in second on Sunday for the Democratic spot. Cancel, who did not return a request for comment, said Sunday after winning that she promises to “take care of the needs of the community,” and also praised Silver, saying he “did wonderful things in our district,” according to the Wall Street Journal. Newell, who has long called for reform in Albany, said the result was no surprise, especially in light of the “broken political process” for filling a vacant Assembly seat. Instead of a small group of Democrats choosing a candidate, a spot should be filled like a vacant City Council seat, Newell said. In that process, an election is held where all those eligible can vote for the candidate of their choice, rather than have parties select candidates first. Whoever wins the seat on April 19 — which is the same day as the presidential primary in New York — will still have to face a regular Democratic primary in September and general election in November. Newell is planning on running in September, he said. Along with Cancel and Niou, a republican candidate, Lester Chang, a businessman and naval reservist from Chinatown will also be on the ballot on April 19.